Les Roulottes des Korrigans is 200 metres from the centre of Brasparts, between Quimper and Morlaix. 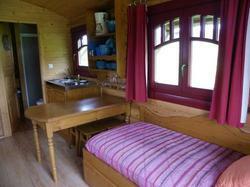 It offers furnished wooden caravans in a large park and a wellness centre with a sauna and a hot tub. All of the caravans are equipped with en suite facilities including a shower and toilet. They also have a private furnished terrace and some offer a kitchenette. In addition to the wellness centre, there is also an onsite creperie with a terrace that offers panoramic views of the surrounding countryside. Children will enjoy the playground and fishing excursions can be organised during the summer months on Lake Saint-Michel. Organic local products, textiles and tableware can be purchased at the onsite gift shop. Free Wi-Fi is available at reception. Located in Brittany, Les Roulottes des Korrigans is 40 km from Plougastel-Daoulas. Free private parking is available. En suite caravan with a shower, kitchenette and a terrace with a view of the countryside. En suite caravan with a shower and a terrace with a view of the countryside.